Action Figure Barbecue: A New Batgirl Review: Barbara Gordon from Batman: Classic TV Series by Figures Toy Co.
A New Batgirl Review: Barbara Gordon from Batman: Classic TV Series by Figures Toy Co.
Articulation: Hinged ankles, hinged knees, elastic ball jointed hips, o-ring waist, o-ring mid torso, o-ring shoulders, hinged elbows, swivel/hinge wrists, o-ring neck, swivel head. Accessories: Shoes, skirt, sweater, jacket, and purse. * I usually don't talk much about packaging on here but I'm making an exception since this packaging is intentionally reusable. There's a plastic zip-tie through the peg hole that says Figures Toy Co. Once you remove that you can easily open and close the durable plastic clamshell. There are some twist ties but a little work will allow you to keep your Barbara Gordon figure on display. I think she looks great in the package as it's very personalized for her with a picture of her in this exact outfit and a few other general Batgirl shots. * I'm not a huge fan of the Mego style but they really do have a pretty wide range of articulation built around a standard body. There's a series of rubber connectors inside that give the neck, torso, hips, and shoulders a lot of movement. If you've never held one in person the figure seems to be kind of a cross between a Marvel Legends figure and a Barbie. * First, underneath Barbara's jacket is a simple blue skirt and white sweater. Both pieces of the outfit fit really well and look fantastic. They're kind of simple looking but that's part of the Mego styling. Take off the jacket and you have a great standard Barbara Gordon for your collection. 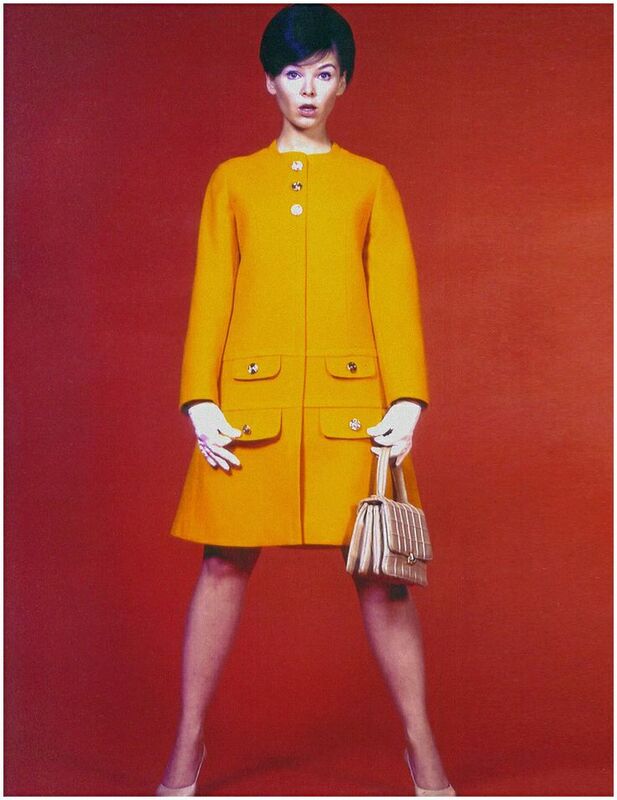 * Over the skirt and sweater Barbara is wearing a really nice yellow coat with awesome buttons. Here's a picture of the original outfit this figure is based on and I think Figures Toy Co. did a pretty nice job in translating it to the Mego style. It fits well over her other clothes and really stands out on display. * Babs' only handheld accessory is a handbag that complements her outfit. It's made from kind of a plastic/ pleathery material with a metal clasp on the strap. It also legitimately opens and could store one or two smaller accessories inside. * I'm really divided by Barbara's headsculpt as I have some pretty heavy criticisms of it but first I want to point out the positives: If you look at the headsculpt from the nose up, it's pretty good. The eyes, hair, and nose really capture Yvonne Craig's likeness. Even though this is done in a retro style, it's still quite recognizable. *The problem with this headsculpt is the lower half of the face. The first problem is that the jawline seems much too large and rounded. It really just seems far to oversized to work with the rest of the face. Secondly, Figures Toy Co. went with a rather odd expression. I wish they'd gone with a smile or something rather than this odd glare. Everyone was always so happy and silly in the 1966 series and that look would have been so much more fitting. * Barbara comes with a pair of yellow high heels. They look good on her but they fall of really easily. I mean these things just seems to slip right off of her feet. I wish they were a bit tighter or that they had been sculpted on so as to prevent these problems. I'm not a Mego collector by any means but I do think that Figures Toy Co. is doing some cool things with their Batman TV Series line. I love their character selection and the costumes but I'm really not sold on this headsculpt. I'm hoping that they try another headsculpt in the figure as this one just doesn't thrill me. Still, the outfit is really nice and the overall presentation (including the resealable packaging) is quite fabulous. This is a Good figure if you're into this style of figure or a fan of the character, but my guess is that this toy targets a pretty narrow collecting demographic. Still, it's amazing that Figures Toy Co. can keep their 1966 line going while Mattel's pretty much died right away. The only other Mego styled Batgirl figure I've reviewed on the site is Batgirl from Figures Toy Co.'s Batman Retro: First Appearance. I've reviewed plenty of other Batgirl stuff, all of which is archived at my virtual Batgirl museum. Too bad they didn't nail the headsculpt, since that's pretty much what makes this figure. I get where they are going with this one, but like you said, their demographic is pretty small. Personally I'd have preferred to see a 'maskless' Batgirl, or perhaps her Batgirl top underneath her overcoat. Still, it's Yvonne Craig, and that's pretty cool no matter what. They seem to be all about variants (very easy in a line like this) so I wouldn't be surprised to see her in the future. I mean, they've got 3 Batgirl/ Barbaras out right now and have a fourth variant coming soon (BG in the wedding dress).